Discussion in 'The Lounge' started by DirtMcGirk, Oct 9, 2009. Its gotten to the point where I need to get out of town for a month. Some alone time, just me and the bikes, is what I really need right now. I'm going to blast out of town from October 19 to November 19. 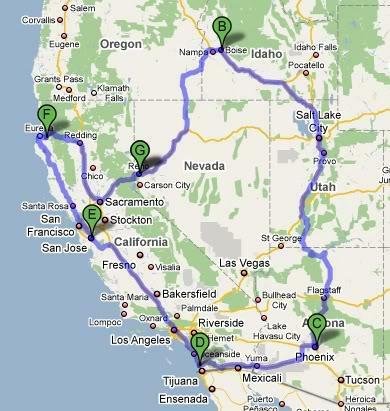 Right now the plan is to head east into Idaho. I have an old college buddy who lives outside of Boise. Then south into AZ. A friend of mine lives in Tempe. Then across I-10 to San Diego. Up to the Salton Sea. Stop and surf in LA. Drive up through the central valley, back towards Reno at some point. I need ride suggestions. I figure I'll take my XC, my DJ and the Nomad in the back of my truck. This is roughly the route I am going to take. Any suggestions on places I shouldn't miss? Any spots I can DJ you'd be willing to PM me? why are you so fascinated with the salton sea ? it's a toilet . let me know when your going to be in the that area we'll hook up for a ride . You really should flip that circle and pass through steamboat springs colorado, it is not a popular mt but their trails are freakin epic. There are vert berms all over the place, and the single track is sick. just move away from reno....problem solved. But I've got money in the bank, not much going on here of merit, and it feels like a good time for a road trip. I have no idea what my deal with the Salton Sea is. Wish I could figure that one out. But alas I cannot, so I just roll with it. Roadtrips are a great way to figure out priorities. Green: I am going to be up in Seattle next weekend. I'm back off the beers again, but do you guys want to hook up with the ex-dr and I and have dinner maybe? Sun valley is fun, I'd swing that loop over to Fruita and Moab if it were me. Plenty of fun trails in SLC area too if you beat the snow.